A satire that mocks itself is always a powerful statement, so a comedy that is broadcast by the BBC whilst also undermining the corporation is a notion that had the potential to backfire. John Morton has written a riotous sitcom that marvellously portrays the apparent food chain of the business, from professionals with personal assistants when they don’t really need personal assistants and interns that cause more hassle than they solve. It shows the BBC as a flawed establishment, much like all establishments of course, therefore adding an undeniably human aspect to an otherwise corporate-seeming world. Here we have a programme of layers, built upon the sturdy foundations of a solid and diverse cast, which ranges from the straight-faced groundings of Hugh Bonneville, Jason Watkins, Nina Sosanya and Sarah Parish to the comic wonders of Jessica Hynes and Monica Dolan. Ian Fletcher (played by Bonneville) is a calm and endearing frontman, armed with his folding bike, good intentions and responsibility as a mouthpiece for the department, which sometimes winds him into difficulty. The embellishments come in the form of the fantastic script writing, which combines silliness (“Meanwhile, it is multiple weeks later,” “Those who are ethnically not so white”) with fierce and often outrageous wit (note the number of times per episode “Sky” or “Jeremy Clarkson” is bleeped during a “Damage Limitation Meeting”). The low-energy sarcasm of the more competent team members contrasts hilariously against the disorderly shambles from the likes of Siobhan Sharpe (Hynes), who works in marketing, and Entertainment Format Producer David Wilkes (Rufus Jones). Morton presents the BBC as a microcosm of catastrophe that the characters go to great lengths to hide from their bosses and the public, which heightens the irony to often uncomfortably funny levels. The result is that the group are often left running round in circles; quite often literally. The use of some of the BBC’s own sweethearts to mock the company is another device that aids the humour of this satire, such as David Tennant’s distinctive voice as narrator. The patronising nature of the voiceover highlights the absurdity of the characters’ incompetence, only increasing in its noticeability over time, making for truly hilarious viewing. 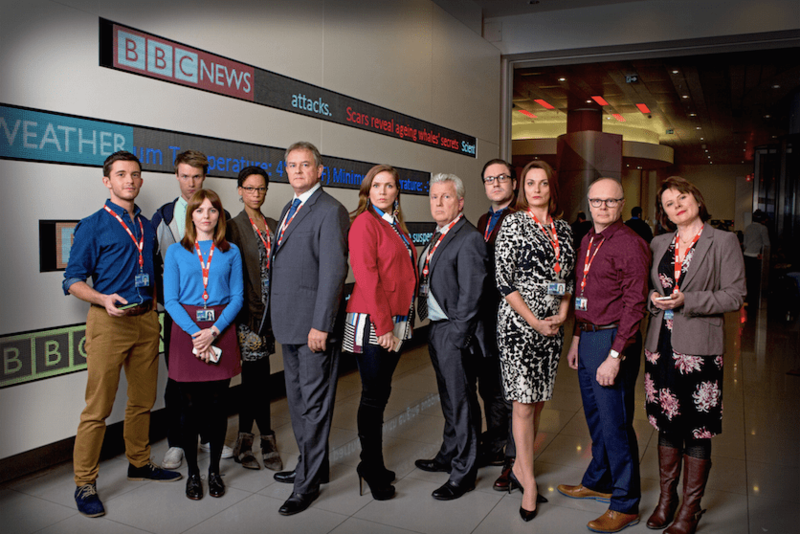 W1A is a remarkable programme because the cast and crew are effectively satirising themselves. I think the best part is that those who have no first-hand experience of the BBC can never truly decipher which elements are true, which are exaggerated and which are only briefly exploited. This air of mystique is intriguing, and I feel it elevates the comedy to a whole new level.